Some of St. Mary’s Catholic School students may not be old enough to remember “Man in the Mirror” by Michael Jackson, but all understood the meaning behind those lyrics after a visit from a musician on Monday. 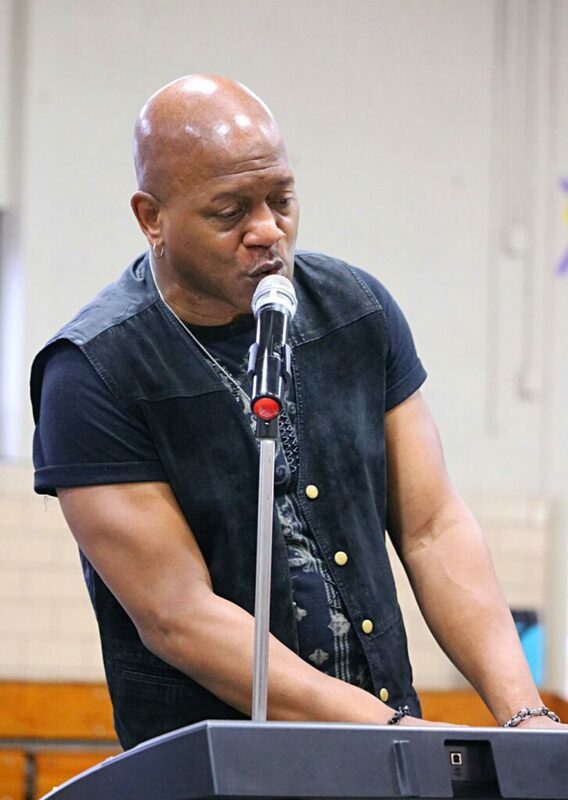 Joseph Allen Wooten, keyboardist for the Steve Miller Band, 3-time Grammy-nominated artist, creator of I Matter, You Matter and friend of St. Mary’s school teacher Johnna Bingham, shared his story with students and how even one person can make the world a better place. After opening with the keyboard rendition of the King of Pop’s song, Wooten said he and his brothers idolized the Jackson 5. He and his four brothers learned instruments very early in life, and later created The Wooten Brothers. Wooten said talent did get them a record deal in the mid 1980s, at the same time Whitney Houston signed a deal with the exact same company and producer. The keyboardist wants students to learn from their mistake, and know that it is equally as important to be smart. The chorus of the song states “I am here, and I matter,” and has a lot of meaning to the artist. “I wrote that song because I like the message that everybody is as important as everybody else,” Wooten said. Wooten said there are those that are less fortunate that need others to be a voice for them in the world, and even one person can make the world a better place. More information about Joseph Wooten and I Matter, You Matter can be found at www.imatteryoumatter.com.